You can visit the Customer Zone and then click on the “Forgot Password?” button. If you don’t have any security questions set, it would give you a message where it says: Validation Email Sent, The password reset process has now been started. This means you can now login to your email address on your email program(Microsoft Outlook or any other email client) and view the email we have sent. The Subject of the email would be Your login details for 1-grid. Please read this email. 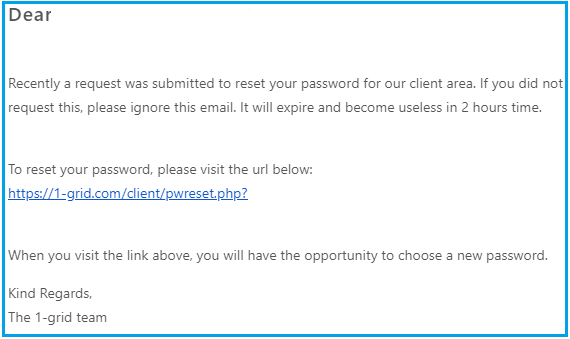 Inside the email, it would say something like To reset your password, please visit the URL below. You can now copy the link just below that sentence and go to your internet browser(Firefox, Google Chrome, Internet Explorer etc) and visit that link. Once you have done this it would take you to the Lost Password Reset page where you can now enter your new password, confirm your new password and then press Save Changes. 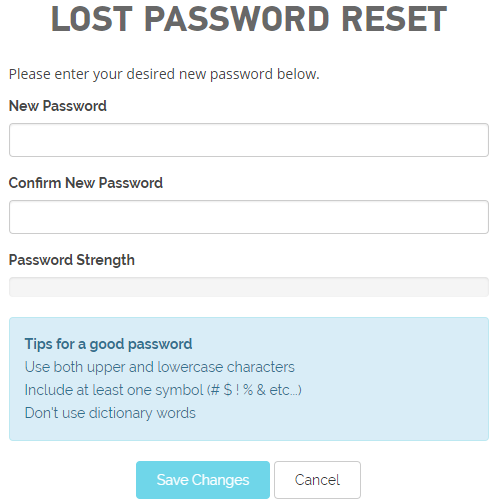 Please make sure the Password Strength is strong for the password reset to take effect.